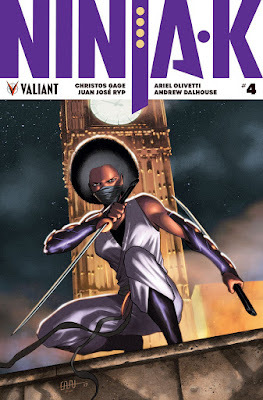 In issue #3 of Valiant Entertainment’s ninja spy series, Ninja-K, Colin King is horrified to learn some damaging information about the agency he has spent his life serving, MI6. After receiving this shocking information, King sets out on a mission to confirm what he has been told, clearly hoping that it is just web of lies being spun by a disgruntled former agent, but anticipating the fact that it may be his reality. Issue four showcases him seeking out another “retired” team member, the elusive Ninja-G, long thought deceased by the bureau. Ninja-G brings an extra level of baddassery to this particular series. 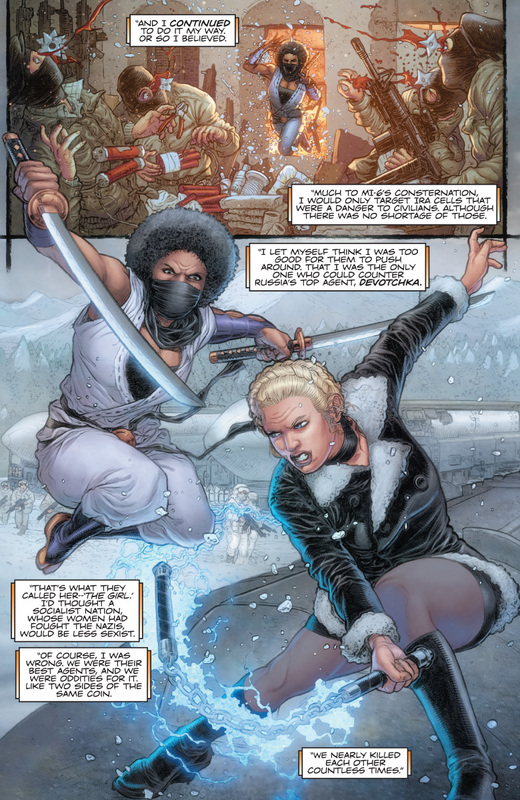 The first woman and first black ninja agent, Ninja-G is a strong warrior woman that I would love to see more of in this series. She offers more insight into the secretive practices of the Acclimation Bureau, showcasing the fact that not only are they a real threat, but they have influenced the lives of every agent in history, even to his horror, King’s. Writer Christos Gage is able to expand upon the inner conflict that Colin King has upon learning that his entire life and career has been manipulated, and his struggle to decide what exactly to do with this truth. At this point in the story, King not only is experiencing extreme anger, we are led to believe he is ready to begin seeking revenge. The pieces to the plot puzzle that has been created within this series are slowly coming together, leading us to believe that when King does finally act upon his plan of revenge that we will be seeing quite an exciting and climactic end. Gage has been doing an excellent job of weaving a story that holds your attention and leaves you wanting more. Issue four sees the art of the series taking a different turn. Though I am uncertain as to why, it seems that the art of Tomas Giorello has been replaced by the work of Juan Jose Ryp, a Spanish artist who is known for his work with several Avatar Press titles. Ryp’s artistic style is significantly different than Giorello’s and I noticed the difference immediately, even before I realized artists had been switched for this book. In my opinion, Ryp’s style is less detailed and the characterization lacks a level of emotional connection that the rest of the series has seen. Though there are several pages, particularly the ones that are action based, not divided into panels and lack dialogue, that are certainly visually stimulating and eye catching, this issue just doesn’t pack the same punch artistically as the prior issues. In a series where every detail is important, and there is so much emphasis on emotional struggle and conflict, I found that the art in issue four just suffered a real disconnect from the writing. The story of Ninja-K has me reading with greater interest and anticipation with every issue. I am greatly looking forward to seeing what lies in the next issue of the story and being able to see how Colin King’s plot of revenge begins to take shape.